500 Soil Nails to depths between 10m and 20m, plated and meshed. 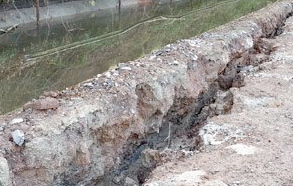 Following excessive weather conditions in South Wales in February 2014 Condor received an emergency call out to attend to a major embankment slippage away from the Monmouth and Brecon Canal towpath at Llanfoist. Given the extent of the slip and risk to a property some 1oo feet down the bank from the towpath it was imperative to react quickly and mobilise accordingly. 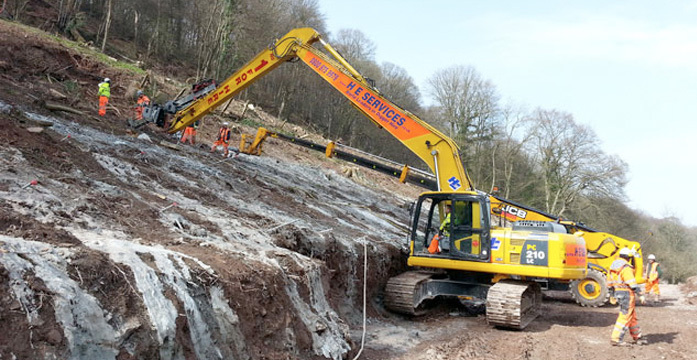 A major logistic exercise was necessary as the area was densely populated with major trees that required removal and the gradient of the bank required insertion of a haul road for access. A design was finalised through consultation between the Canal and River Trust (CRT) and Condor with a view to re-opening the canal as soon as possible given the imminent commencement of the canal boat season and the effect this would have on local businesses. Substantial plant was required with both a 22t Excavator and 15m long reach machine necessary to reach different areas of the bank and enabling Condors 1.8t TEI drill mast to be used giving speed, reliability and high production numbers. For the more extreme areas Condor’s remote control remote access machine with Marini mast proved access that would have been unreachable with any standard rig and set up.